Slydale Hollow: DIY with foam board. 2 layers of board, 1 thin layer for the walkway/pier, 1 full width layer for the water. The brown cardboard glued on & planks drawn in. The water is blue paint. 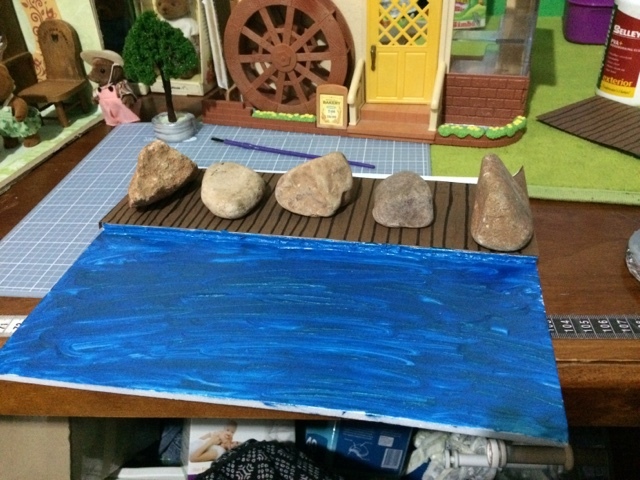 The rocks are there at the moment keep the 2 pieces together while the glue dries, & then some of the rocks will be used as scenery. The water does look good with the rocks! I like it Chill!. You managed to give the water a nice effect. Thanks. Lol all I did was pour a heap of paint on & swirl it from side to side!